Our Android and iPhone apps deter you from using your phone behind the wheel. The Driver Portal allows for visibility into your loved one's distracted driving behavior and provide rewards to help them break the habit. 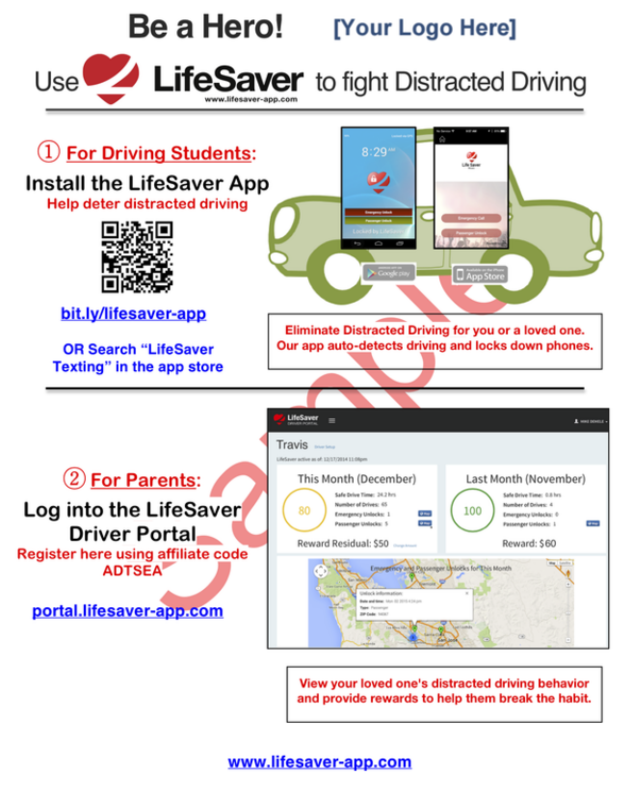 Our solution is FREE to ADTSEA members and your respective student drivers. - Drivers aged 15-19 are most likely to be involved in a distracted driving crash. - Drivers with LifeSaver drove without unlocking the phone in 98.5% of their drives. We can co-brand this flyer with your logo, so you can distribute to your students and get them safer on the road. Click on my email below to send me your logo. twitter: @lifesavermobile Copyright © 2015 Life Apps LLC, All rights reserved.